Chicken breaded in all the spices from an everything bagel then stuffed with cream cheese creates the ultimate indulgence. 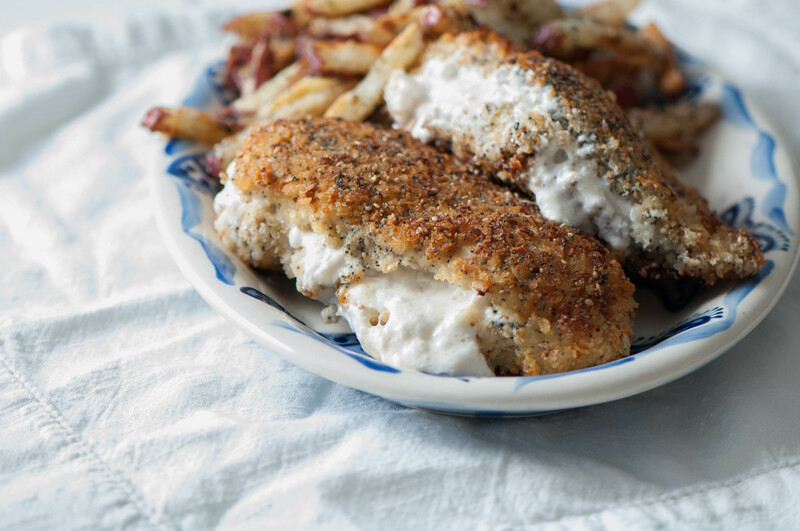 Use that extra seasoning for some baked french fries and you have an entire meal with this Cream Cheese Stuffed Everything Chicken with Everything Fries. Yum! An everything bagel with cream cheese is pretty much my favorite breakfast ever. I very rarely indulge but I absolutely love them when I do. I’m kind of a carboholic if you didn’t know so I decided to give up bread and pasta for Lent and of course now I can’t seem to stop thinking about bagels. So I decided I need to find some kind of substitute until I can finally toast up a bagel and smear it with way too much cream cheese. In comes this Cream Cheese Stuffed Everything Chicken. Oh and I had extra everything topping so I decided to throw it on some oven fries. Because fries are always a good idea. You’re welcome. We were all seriously “mmmm-ing” all through dinner and even the professed chicken hater ate it (dipped in ketchup of course because my family likes to kill my soul a little at dinner). Boneless, skinless chicken breasts are stuffed with cream cheese then coated in minced dried onion, garlic, poppy seeds, sesame seeds, kosher salt and breadcrumbs. Shallow pan fry those bad boys and throw them in the oven to finish cooking while the fries are baking and dinner will be done in a snap. Preheat skillet over medium heat. Preheat oven to 425 degrees. Cut a slit in each chicken breast. Stuff each with 2 tablespoons of cream cheese. Set aside. Mix together the sesame seeds, poppy seeds, garlic, onion and kosher salt. Set up breading station. Fill one pie plate with flour and season lightly with salt and pepper. In another pie plate, crack the egg and whisk it with a splash of milk. In the last pie plate, mix together the panko and all but 1 tablespoon of the spice mix. Dredge the chicken in the flour, then the egg and last in the breadcrumb mixture. Heat olive oil in the skillet and cook chicken for 4 minutes per side. Place skillet in the preheated oven and bake for 15 minutes, or until no longer pink and cooked through. Meanwhile, toss the potatoes with the olive oil and remaining 1 tablespoon spice mixture. Place in a single layer on a baking sheet. Cook for 40 minutes, flipping halfway through.